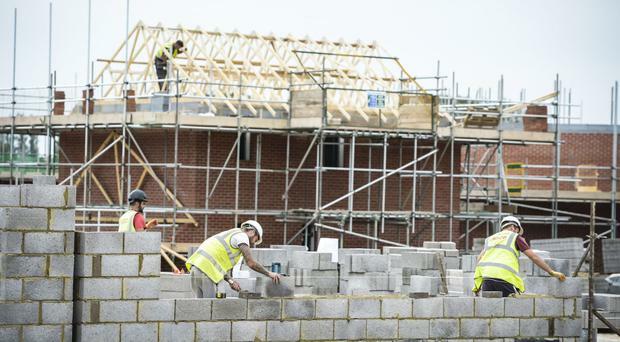 There was a rise in housebuilding across Northern Ireland in the last three months of 2017, but overall the construction sector paints a mixed picture, according to a new survey. A rise in housebuilding was one of the main "bright spots" as overall construction workloads edged upwards in the final quarter of 2017, according to the RICS and Tughans Northern Ireland Construction and Infrastructure Market Survey. It showed that private sector and public sector housing activity "increased in the three-month period", according to the net balance of Northern Ireland respondents. There was also a small increase in "private commercial and infrastructure activity". But the survey pointed to a fall in "private industrial and public non-housing activity". The overall balance stood at +6%, which lags behind the rest of the UK regions and "suggests that overall growth in the Northern Ireland construction and infrastructure sectors was lacklustre" in the last quarter of the year. "It would perhaps be fair to say that the construction sector in Northern Ireland is something of a mixed picture," Jim Sammon, RICS Northern Ireland Construction spokesman, said. "As the survey suggests, house building activity in some areas continued to grow, and we are seeing good activity in areas such as hotel development. "But there is a divergence between greater Belfast and some other areas, and a divergence between sub-sectors. Some improvements in procurement processes are being made but the planning process remains unnecessarily difficult." The survey also pointed to a "lack of sufficiently skilled workers (which) appears to be an obstacle for many construction businesses". It also said that, anecdotally, some firms suggested that the current exchange rate was leading some EU nationals to move elsewhere for work. Tim Kinney of Tughans said: "It is encouraging to see even a small upturn in infrastructure workloads, although the overall picture is one of limited growth. "It is good news that private house building activity and commercial activity has risen and those responses back up evidence of a spike in local construction recorded in the latest construction bulletin." By Lisa Wilson For some years now, Northern Ireland has come out on top of the UK's happiness league table, with people here reporting higher degrees of happiness than people in England, Scotland and Wales. With 61 employees across three offices and over 500 candidates engaged in work every week, Direct Medics has said it is proud to be the largest provider of temporary healthcare staffing to hospitals across Northern Ireland. By Staff Reporter The co-founder of women's equality organisation Lean In has visited members in Belfast.